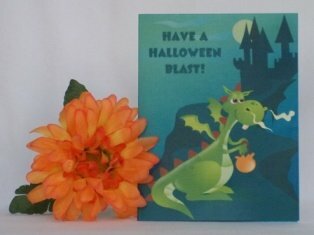 Use paper stacks for Halloween card crafts. 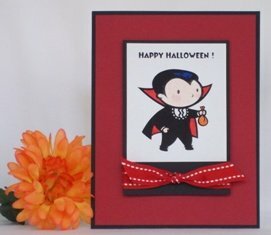 Making Halloween cards is easier with paper that coordinates so enjoy these unique Halloween card ideas. I used this template for my other handmade card making project so it's a versatile design for paper card making ideas. 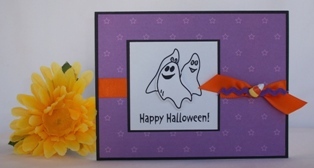 It's common to use purple for homemade Halloween cards and when the paper stack has coordinating pattern paper, it makes color coordinating the card easier. To help make the purple color stand out, I used black as a border. I also found a pack of die cuts shapes for my handmade Halloween cards and because there were so many in the pack, I'm able to use them for lots of Halloween card making projects. The sentiment and crow die-cut shape didn't have tape so I added foam tape in the back to give this Halloween greeting card dimension. 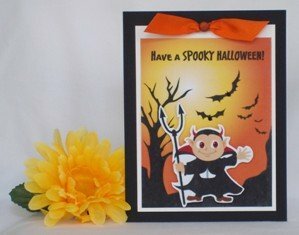 Many of my homemade card ideas come from sketches and for this Halloween card idea, I used an ebook I purchased called 50 Card Making Sketches. I altered the card a little bit but pretty much kept the same design. 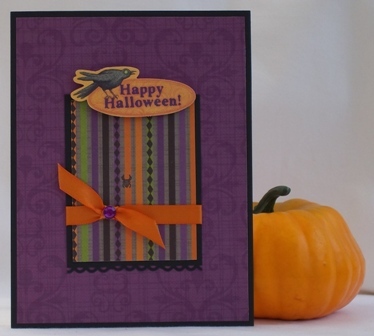 Try a border punch to make Halloween cards. I used a scallop border punch but try what you have in your tool box. If you don't have a border punch, use scissors with the pattern like zig zig or scallop scissors. I used ribbon and a gem for my handmade Halloween card but you can use whatever you have in your supplies box. 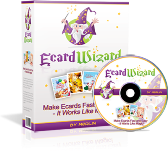 A button or brad can work well too to build your own Halloween cards but stick with Halloween colors like purple, black, orange or green.